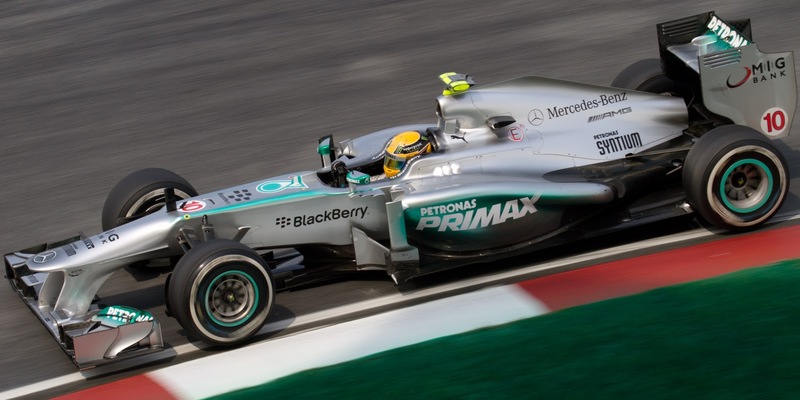 Lewis Hamilton struggles in practice. He bemoans the car's handling. It looks like his team mate will lead the way for Mercedes as we enter qualifying. But yet, when we reach the important hour Lewis blitzes everyone and snatches pole. Sound familiar? Yes it should. It happened last week in Silverstone. And it happened again in the Nurburgring today. We really should know better than to write the prodigious Lewis off. His is one of those talents that means pulling rabbits out of the hat is always a possibility. And so it was today, 'taming the wild bull' of his Merc (to use his words from last week) and beating the nearest challenge by a clear tenth of a second to thus ensure he'll start tomorrow's Grand Prix from the front. Not for nothing he described it as 'really overwhelming'. It was a qualifying session full of surprises, with an increase in track temperature seemingly changing things and drawing the pack together. Broadly speaking the order, Lewis aside, was as expected, but things were much closer than was anticipated. And this caught out Nico Rosberg's side of the garage most egregiously. Despite his being right in the front-running mix, he dropped out before Q3, someone making the decision to not go for an additional run at the end of the second session. This confines him to start 11th instead, with much to do. Also just like last week (ignoring Rosberg's woes), after the Merc challenge we have the Red Bulls, with Sebastian Vettel ahead. And in a further parallel with seven days ago Seb looks to be best-placed for the race, particularly given the Bulls' longer runs yesterday looked stronger than the Mercs'. Seb admitted that but for an error in the first sector of his vital lap he may well have pipped Lewis, but still his anticipation of tomorrow sounded ominous: 'We have all confidence for tomorrow...we should have a good race from there (the front row)...I'm looking forward to the race'. Still, if tomorrow's race also has parallels with last week then Lewis won't be giving anything away easily. And for all of the wrestling with the question of how the revised Pirelli tyres would alter things, the answer so far seems to be 'not very much'. Reshuffles compared with what we had before look to be minimal; against expectations the only change seems to have been Lotus getting a bit of a leg up. It remains to be seen what the revised tyres do to fortunes in a race though. And to the relief of everyone there have been no failures so far. 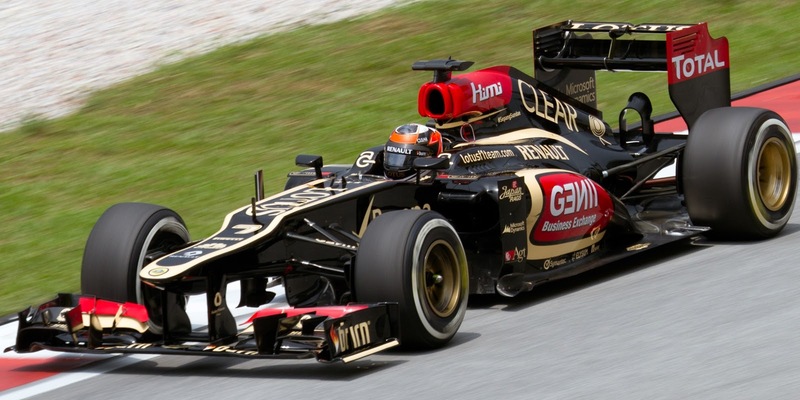 Lotus's improved form, plus the fact that the Enstone cars tend to be stronger in a race anyway, means that Kimi Raikkonen starting from fourth has a conspicuous dark horse quality about it (and not just because of the car's paint job). 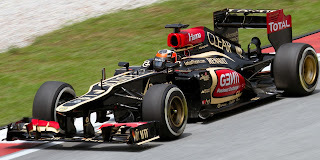 He has a rear gunner with Romain Grosjean starting fifth, who's shown improved form since we returned to Europe. And what of Ferrari? Again just like seven days ago it's had a slightly bewildering time of it in the Nurburgring, but unlike seven days ago looked right back in the mix come Q2. However, at that point the team chose to roll the dice, and both the red cars will tomorrow start on the harder, medium, tyres. Even with the fact that the soft doesn't seem to have massive longevity, and that temperatures are expected to stay high, you can't help but think that by starting in P7 and P8 (Massa is ahead of Alonso, unusually) they've given themselves an awful lot to do. And it seems particularly odd given that, as mentioned, Q2 suggested that they weren't all that far off the pace. I guess tomorrow we'll find out whether it represents madness or genius. And in between we have one Daniel Ricciardo, who'll start sixth after his second impressive qualifying run in a week. Many believe that Raikkonen to Red Bull to fill the Mark Webber-shaped hole in 2014 is a done deal, but if it isn't, and it falls through for whatever reason, then Ricciardo isn't half positioning himself well and right on time. Thus we have a grid for tomorrow's race with a rather well-poised look. Lewis leads, but there are reasons to think that various of those behind might offer him a serious challenge, and for various reasons. Add to this that the tyres may be hard to manage, and in any case represent a bit of a leap into the unknown. Make sure you don't miss this one. Is Hamilton really moaning as much as he appears to during the practice sessions or is it the media who (understandably), raise the profile of what might be classified more as "comments" ? Same goes for Rosberg - I see articles with the headline "Rosberg Blames team" - and all the articles I've read from him give the impression that he blames the team when he runs into some issue, makes him sound a bit precious at times. However, in the On-Screen interviews I see they rarely appear as disgruntled \ me-focused as the articles make them appear to be. Hi Seamus. Lewis definitely has been complaining about the car's handling this year (and it sometimes seems he uses interviews as a bit of a confessional), though obviously given it's Hamilton his words get reported widely. And also given it's Hamilton some choose to sensationalise what he says a bit. I agree with you on the Rosberg point. I too saw the 'Rosberg blames team' headline, which was very misleading, as his actual words were much more measured. He just said the team made a mistake rather than sought to apportion blame. It was the same last week when I saw 'Alonso blames Ferrari' headlines when he did nothing of the sort! But I guess these days people will do whatever it takes to drive some web traffic. I'm surprised when issues like Rosbergs happen though. I fell asleep somewhere towards the end of Q1 (Live in Sydney, it was close to 11 PM =D), so I dont know exactly what happened. Couldnt they tell about 3 minutes out that Rosberg was in trouble , in order to get him out and start a flying lap before time ended ? (Obviously, they didnt, but given what master strategists these guys are, it surprises me). Oh well, 10 hours to the race, need to get a nap in so I stay awake ! Looks like Fernando may have a fighting chance !